Review: BT Halo – Block nuisance calls, on your landline and your mobile! Landlines are almost obsolete in the UK. However, if like me, you spend a lot of time working on a site which has bad signal, a landline is one of the greatest gifts you can have. BT has long been the representative of all things landline in the country. 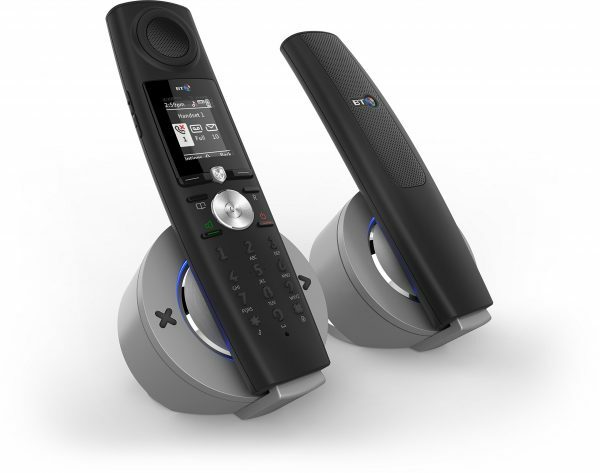 With their latest 8500 series, they brought advanced call filtering to everyone. Now, with the BT Halo (or the BT 9500), they’re bringing the one thing your landline has been missing: a connection to your smartphone. Pairs to your smartphone, letting you make and receive calls from your phone. My wife gets a mention here. She has been asking for one of these devices for ages. Finally, we have it! The base makes the phone worthy of the name Halo. It gives to you a blue glow on the base, and a couple of buttons which let you play and delete messages. The back of the base has a couple of USB ports on it, as well as connect button to let you find your phones. You can also pop the phone both facing up or down on the base. The phone itself is rather different from the design of the 8500 series. It is long, and feels a bit soft in your hand. It has also been ergonomically designed to give you a better fit in your hand as well as around your face. While the screen is nothing special, the phone itself has light up buttons (90s style! ), and they light up as soon as you lift the phone off the base. This makes it particularly easy to use if you’re using it in a darker environment. On top of the usual button keys, there is a four way key for navigation as well as dedicated keys such as contacts and speakerphone. We are quite used to talking about the GUI on smartphones these days, so it is worth mentioning that the GUI on this is pretty basic. It is almost the same as that found on the 8500, and offers you basic functionality and settings. The main USP on offer here is the Bluetooth feature. The phone allows you to connect up to two smartphones to this. This means that you could have a personal or a work one to this, or have one for yourself and one for your other half. Once paired, the usage is rather simple. You can make and receive calls using your mobile’s SIM but using the landline phone. This is particularly useful for those who find making long phone calls on mobiles annoying – be it due to how heavy they weigh, or just don’t like the idea of holding an RF device next to their head. Other advantage comes from the fact that you can download the contacts from your phone down to this device. This can be up to 3000, which gives you plenty of room. As far as usage goes, you can walk up to 10m away from your phone. While this feels rather small, you’ll find most British homes do not pose any challenges in terms of distance. On top of this, you have an extra feature which allows you to block nuisance calls. It works best if your phone provider gives you CLI (Caller Line Identification) information. While this is pretty standard on mobile network providers, some phone companies such as Virgin still charge extra for this. Others, such as EE give it to you for free. The main way the phone works is that when you get a call, it goes to an automated playing and asks for the person to identify themselves. Following this, it puts them on hold and rings to tell you who is calling. From there, you can either put that number in a list to be constantly allowed, or permanently blocked. You can also block calls from a specific area code or a suffix. For example, don’t like calls from a particular country? Block it! (Fun fact: we often get phone calls in a different language from Sri Lanka. Our phone number probably belonged to their family. This has been a rather easy way to filter those calls!). If you don’t have CLI, the process will have to take place every single time a phone call comes. With CLI, the process keeps getting better as you get more and more calls. Of course, if you do get a phone call on your mobile phone, the CLI does work and you can filter out calls there. More on the BT Halo can be found on the BT website. It is available from them as well as various online retailers such as Amazon. Prices have dropped massively on this since this came out. Originally it was being sold for £99 for the single set and £139 for the twin set pack. On Amazon the current prices sit at £67.31 and £85.71, while the BT website has it for £79.99 and £99.99 respectively. This phone ticks all the boxes one could want from a high-tech landline phone. The recent drop in prices also means that this is rather affordable for those who can make use of it. Next story Get Blu-ray Creator from Leawo – free this Halloween!